-- None -- 305 Lincoln Road (Main Office) Miami Beach, FL 33139 My Hotel is not listed 1 South Beach - 2341 Collins Ave. Albion - 1650 James Ave. Alexander - 5225 Collins Ave. Aloft South Beach - 2360 Collins Angler's - 660 Washington Ave. Aqua - 1530 Collins Ave. Astor - 956 Washington Ave. Avalon - 700 Ocean Dr. Barbizon - 530 Ocean Dr. Bay Breeze - 6600 Collins Ave. Beach Paradise - 600 Ocean Dr. Beach Plaza - 1401 Collins Ave. Beachcomber - 1340 Collins Ave. Beacon - 720 Ocean Dr. Bentley - 510 Ocean Dr. Best Western - 4101 Collins Ave. Best Western - 9365 Collins Ave. Betsy Ross - 1440 Ocean Dr. Bikini Hostel - 1255 West Ave. Blue Moon - 944 Collins Ave. Boulevard - 740 Ocean Dr. Boulan - 2000 Collins Ave. Breakwater - 940 Ocean Dr. Burleigh House - 7135 Collins Ave. Bus Stop - 21st St & Collins Ave. Cadet - 1701 James Ave. Canyon Ranch - 6801 Collins Ave. Cardozo - 1300 Ocean Dr. Carlton - 1433 Collins Ave. Casa Grande - 834 Ocean Dr. Casablanca - 6345 Collins Ave. (Castle Beach) Castillo Del Mar - 5445 Collins Catalina - 1732 Collins Ave. Cavalier - 1320 Ocean Dr. Century - 140 Ocean Dr. Chelsea - 944 Washington Ave. Chesterfield - 855 Collins Ave. Circa 39 - 3900 Collins Ave. Claremont - 1700 Collins Ave. Claridge - 3500 Collins Ave. Clay - 1438 Washington Ave. Clevelander - 1020 Ocean Dr. Clifton - 1343 Collins Ave. Clinton - 825 Washington Ave. Colony - 736 Ocean Dr. Comfort Inn Oceanfront - 1238 Collins Ave. Congress - 1052 Ocean Dr. Continental - 1825 Collins Ave. Continental Bayside - 146 Biscayne Blvd. Copa Bella - 5025 Collins Ave. Courtyard Marriott - 200 SE 2nd Ave. Courtyard Marriott - 1530 Washington Ave. Courtyard Cadillac Marriott - 3925 Collins Ave. Crescent - 1420 Ocean Dr. Crest Hotel - 1670 James Ave. Crystal Beach - 6985 Collins Ave. Seagall Hotel (Old Days Inn) - 100 21st St. Days Inn (Lexington) - 4299 Collins Ave. Days Inn - 7450 Ocean Terr. Days Inn Thunderbird - 18401 Collins Ave Deauville Resort - 6701 Collins Ave. Deco Walk - 928 Ocean Dr. Delano - 1685 Collins Ave. Delores Guesthouse - 1420 Collins Ave. Dezerland - 8701 Collins Ave. Dorchester - 1850 Collins Ave. Dorset - 1720 Collins Ave. Doubletree Grand - 1717 Bayshore Dr. Doubletree Surfcomber - 1717 Collins Ave. Econolodge - 1435 Collins Ave. Eden Roc - 4525 Collins Ave. Edison - 960 Ocean Dr. Epic - 270 Biscayne Blvd Way Essex House - 1001 Collins Ave. Fairwind - 1000 Collins Ave. Fashionhaus - 536 Washington Ave. Fontainebleau - 4441 Collins Ave. Freehand Miami - 2727 Indian Creek Dr. Gansevoort - 2377 Collins Ave. Gale Regent South Beach, 1690 Collins Ave. Grand Beach - 4835 Collins Ave. Grandview - 5900 Collins Ave. Haddon Hall - 1500 Collins Ave. Harrison - 411 Washington Ave. Hawaii - 7430 Ocean Ter. Hilton - 1601 Biscayne Blvd. Hilton Vacations Club - 1430 Ocean Dr. Holiday Inn - 4333 Collins Ave. Hotel Eva - 1506 Collins Ave. Hotel Ocean- 1230 Ocean Dr. Hyatt Regency - 400 SE 2nd Ave. Impala - 1228 Collins Ave. Intercontinental - 100 Chopin Plaza International Hostel - 236 9th St. Jazz - 321 Collins Ave. Joe's Stone Crab - 11 Washington Ave. JW Marriott - 255 Biscayne Blvd Way Kent - 1131 Collins Ave. La Costa - 5333 Collins Ave. Loews - 1601 Collins Ave. Loft - 952 Collins Ave. Lombardy Inn - 6300 Collins Ave. Lorraine - 2601 Collins Ave. Majestic - 660 Ocean Dr. Marco Polo (RAMADA) Marlin - 1200 Collins Ave. Marriott Biscayne Bay - 1633 Bayshore Dr. Marriott South Beach - 161 Ocean Dr. Marseilles - 1741 Collins Ave. Mercury - 100 Collins Ave. Metropole - 635 Collins Ave. Miami Beach Resort - 4833 Collins Ave. Mimosa - 6525 Collins Ave. Mirage - 8925 Collins Ave. Monaco - 17501 Collins Ave. Lords Hotel - 1120 Collins Ave. Nassau - 1414 Collins Ave. National - 1677 Collins Ave. New Hotel - 7337 Harding Ave. Newport BeachSide Resort - 16701 Collins Ave. Ocean Five - 436 Ocean Dr. Ocean Grande - 3651 Collins Ave. Ocean Pavillion - 5601 Collins Ave. Ocean Reef Suites - 1130 Collins Ave. Ocean Surf - 7436 Ocean Ter Ocean Terrace - 7410 Ocean Ter Ocean Way - 7430 Ocean Ter Oceanspray - 4130 Collins Ave. Palmer House - 1119 Collins Ave. Palms - 3025 Collins Ave. Park Central - 640 Ocean Dr. Pelican - 826 Ocean Dr. Penguin - 1418 Ocean Dr. President - 1423 Collins Ave. Princess Ann - 920 Collins Ave. Raleigh - 1775 Collins Ave. Red - 3010 Collins Ave. Richmond - 1757 Collins Ave. Ritz Carlton - 1 Lincoln Rd. Riu - 3101 Collins Ave. River Park - 100 SE 4th St. Riviera - 2000 Liberty Ave. Rodeway - 7430 Ocean Ter. James Royal Palm - 1545 Collins Ave. Sagamore - 1671 Collins Ave. Sanctuary - 1745 James Ave. San Juan - 1680 Collins Ave. Sea View - 9909 Collins Ave. Seacoast Towers - 5101 Collins Ave. Sense - 400 Ocean Dr. Seagull Hotel - 100 21st Street Setai - 2001 Collins Ave. Shelborne - 1801 Collins Ave. Shelley - 844 Collins Ave. Sheraton Four Points - 4343 Collins Ave. Sherbrooke - 901 Collins Ave. Shore Club - 1901 Collins Ave. Sixty Sixty - 6060 Indian Creek Dr. Solara Resort - 8801 Collins Ave. South Beach Hostel - 235 Washington Ave. South Beach Hotel - 236 21st St. South Beach Marriott - 161 Ocean Dr. South Seas - 1751 Collins Ave. Starlite - 750 Ocean Dr. St. Augustine - 347 Washington Suites on South Beach - 1330 Collins Ave. Tempo Miami - 1100 Biscayne Blvd. The Hotel - 801 Collins Ave. Thompson Miami Beach - 4041 Collins Ave. Tides - 1220 Ocean Dr. Traymore - 2445 Collins Ave. Tropics - 1550 Collins Ave. Venezia - 3865 Indian Creek Dr. Versailles - 3425 Collins Ave. Villa Paradiso - 1450 Collins Ave. W South Beach - 2201 Collins Ave. Waldorf Tower - 860 Ocean Dr. Wave - 350 Ocean Dr. Westgate Resorts - 3611 Collins Ave. Whitelaw - 808 Collins Ave. Winterhaven - 1400 Ocean Dr. Wyndham Garden - 1050 Washington Ave. Wynwood Hotel - 1051 Collins (Princess Ann Apartments) Yve - 146 Biscayne Blvd. Z Ocean - 1437 Collins Ave.
Click the button below to add the Miami To Key West Shuttle (One-Way) to your wish list. After booking online, please call 305-444-4666 to confirm booking. Miami to Key West: Departs from Miami at 7:00 am. Meeting Point 305 Lincoln Road Miami Beach Fl 33139. Stops 30 minutes for breakfast on the way to Key West. Arrival time to Key is 10:45 am. 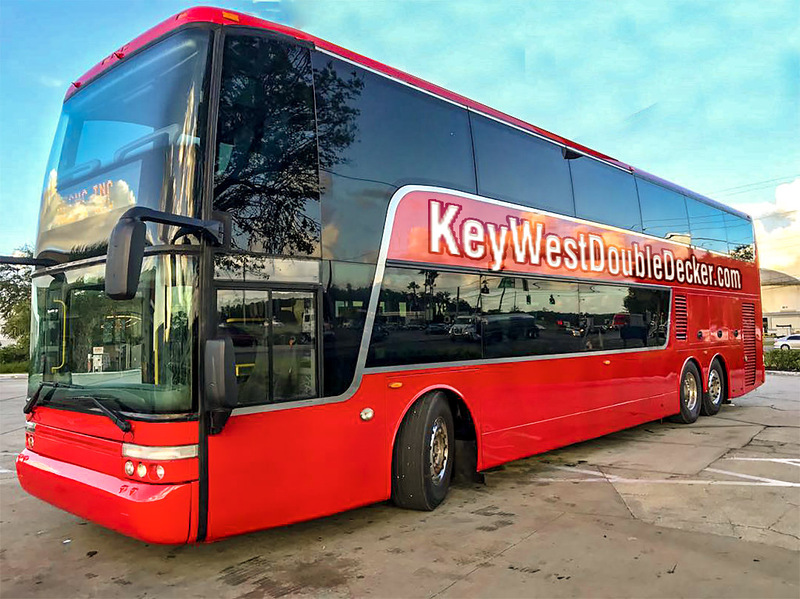 Key West to Miami: Bus departs Key West at 5:30 pm. Must check in 30 minutes prior at meeting point. Meeting Point; 908 Caroline Street Key West, Fl. Bus will be arriving to Miami at 9:00 pm approximately. ***Ticket is valid for either trip. After booking online, please call 305-444-4666 to confirm booking. Discover a city where real estate titles date back to the Kings of Spain. Stroll the palm-lined streets and discover gingerbread mansions, tin-roofed conch houses, the John Audubon House and Ernest Hemingway's home. Walk in the footsteps of Thomas Edison, Lou Gehrig, Harry Truman, and Tennessee Williams. Marvel at the accomplishment of Henry Flagler, an oil tycoon whose Florida Keys Over-Sea Railroad train made its first journey to Key West on Jan. 12, 1912, literally connecting the previously isolated Florida Keys with the mainland for the first time, forever changing the face of the island chain. Gaze at the fabled treasure of the galleon Atocha. Discover tomorrow's fine art treasures by Key West's well-known and unknown artists.